Users should use the Plugwise Source software to define the network, reset devices, perform firmware upgrade, and so forth, e.g. anything which requires user input or interactivity. This binding can be configured in the file services/plugwise.cfg. You can also configure the Stick in Paper UI via Configuration > Bindings > Plugwise Binding > Configure. There is currently a potential issue in openHAB 2 that when you rename or remove devices from services/plugwise.cfg they are still persisted in openHAB. To fix this, enter config:delete Plugwise in the openHAB console and restart openHAB. This will clear the persisted Plugwise configuration and reload it from services/plugwise.cfg. stick.port Yes the serial port of the Stick, e.g. “COM1” for Windows or “/dev/ttyUSB0” for Linux. To determine the serial port in Linux, insert the Stick, then execute the dmesg command. The last few lines of the output will contain the USB port of the Stick (e.g. /dev/ttyUSB0). In Windows the Device Manager lists it in the Ports (COM & LPT) section. On some Linux distributions (e.g. Raspbian) an OS restart may be required before the Stick is properly configured. To access the serial port of the Stick on Linux, the user running openHAB needs to be part of the ‘dialout’ group. E.g. for the user ‘openhab’ issue the following command: sudo adduser openhab dialout. 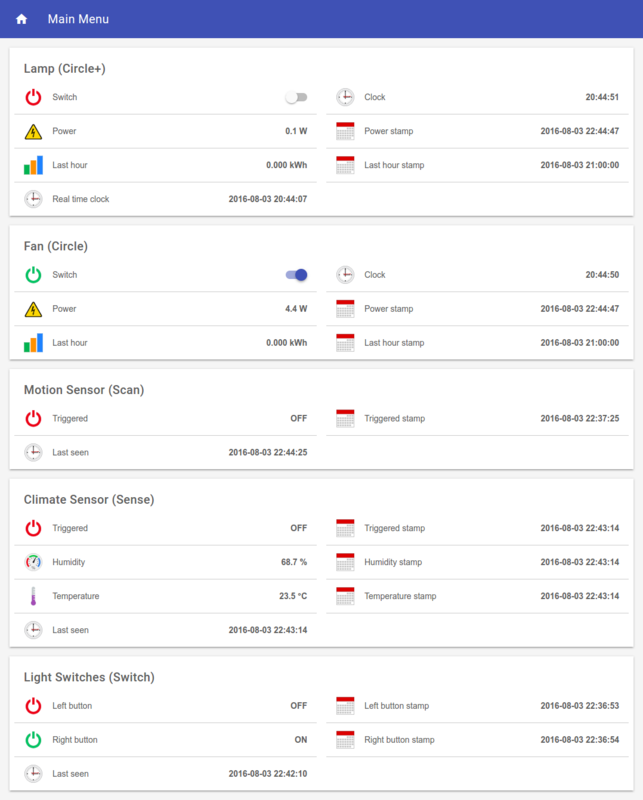 openHAB may need to be restarted when you change the stick.port or device configurations. The Plugwise device configuration is also stored in the (binding) configuration. The configuration file also allows you to assign names to MAC addresses of Plugwise devices. This makes item configurations easier to understand. <id>.mac Yes MAC address of the Plugwise device associated with the ID <id>. The MACs are stickered to the back of Plugwise devices. The binding uses full MACs i.e. also the fine print on the sticker. If you don’t want to get off your chair, climb up ladders and unplug devices all across your home, causing all sorts of havoc; you can also find them in Source. Open Settings > Appliances. Then double click on an appliance. Click on the little Circle icon to the right of the short Address to see the details of a module and the full MAC (Address). Similarly the MACs of a Scan, Sense and Switch can also be obtained from the Appliances screen by double clicking them in the Sensors and other modules list. where <id> is a name you choose to identify a specific Plugwise device. You may not use stick as an <id>. Repeat the configuration with a different value <id> to configure multiple devices. Mains powered devices (Circle(+), Stealth) are polled by the binding for their state. plugwise="[<command>:<plugwise id>:<plugwise command>:<polling interval>], [<command>:<plugwise id>:<plugwise command>:<polling interval>], ..."
plugwise="[<plugwise id>:<plugwise variable>:<polling interval>], [<plugwise id>:<plugwise variable>:<polling interval>], ..."
Battery powered devices (Scan, Sense, Switch) push their state to the binding. plugwise="[<command>:<plugwise id>:<plugwise variable>], [<command>:<plugwise id>:<plugwise variable>], ..."
plugwise="[<plugwise id>:<plugwise variable>], [<plugwise id>:<plugwise variable>], ..."